Timing is everything when it comes to marketing, and none the more appreciative of perfect timing than the biggest name in the I.T. industry, Intel Corporation. Intel grabbed headlines everywhere when it effected a new 'Intel. Leap ahead.' brand identity on the 3rd of January 2006 that sought to position the Intel name around a platform model focusing on four key market segments – digital home, enterprise, health and mobile. Now, all attention is once again converged on Intel as they unveil the new Intel Centrino Duo mobile technology, codenamed 'Napa' platform. Given the phenomenal marketing success of its Intel Centrino mobile technology after it was introduced in early 2003, this change in corporate identity to go towards being a solutions rather than specific hardware provider is not entirely out of the blue, which for some, could even be argued as predictable. The whole idea behind the creation of Intel Centrino mobile technology was marketing, and this clever branding was exactly what Intel needed to distinguish Centrino powered notebooks from all others that were available. Rather than focusing on the type of processor a notebook has, which was how notebooks were classified in the past, the arrival of Intel Centrino mobile technology meant consumers, for the first time, need only look for one such notebook to be assured of good battery life, performance and mobility. This is because all components in a Centrino notebook were first optimized and tested to operate faultlessly together with mobility as the key proposition of the Centrino platform. Although the headache of buying a notebook has been significantly relieved with the availability of packaged Centrino notebooks that are well sorted out for mobile computing, there are still notable differences where chipset and processor technologies are concerned. Exactly a year ago when Intel released its second generation Centrino platform codenamed 'Sonoma', the chipset, processor and WiFi controller were all improved and technically different from those found in the first generation models. Yet, despite the clear disparity in components between the two generations, the same Intel Centrino mobile technology branding was reused for the then new notebooks based on the second generation 'Sonoma' Centrino platform. Inescapably, less technically informed consumers soon became confused and unclear whether or not they were paying good money for "old" Centrino (Intel 855 chipset) or "new" Centrino (Intel 915) notebooks. 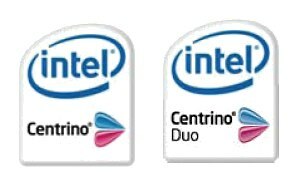 Fortunately, the good folks over at Intel has come up with a completely new badge designed from the ground up to satisfy both the recently implemented corporate identity change and its brand new Centrino Duo mobile technology. This is to say the same group of consumers who were previously confused would be confused no more should they decide to step out and purchase the very latest Intel has had to offer (at least for now). Similar to the two earlier Centrino generations, the new 'Napa' platform is assembled to ensure Intel remains planted in pole position where notebook technology is concerned. And just as with each generation of Centrino platform, the three core components, namely the processor, chipset and WiFi controller, are all supplied by Intel and no other. Intel argues that this unyielding control of components is necessary as the combination of hardware has been designed and rigorously tested in accordance to the four basic vectors of mobility as laid out by Intel for Centrino when it was first launched. That is to say the Centrino Duo mobile technology represents the best in mobile performance, WiFi capability, battery life, and notebook designs and form factors. There are of course other advantages in going with an all Intel solution. Not only do manufacturers get to rely on the strong Centrino branding for notebook sales due to the intense marketing blitz by Intel, they will also be subsidized for marketing Centrino notebooks. Essentially, Intel has created a very attractive win-win situation for its OEM partners, although admittedly, it also explains why notebooks bearing the highly coveted Centrino badge are pretty pricey. So just how different is the 'Napa' from the older 'Sonoma' platform and what significant technological leap can we expect now that Intel is "leaping ahead"? Let's take a closer examination shall we?